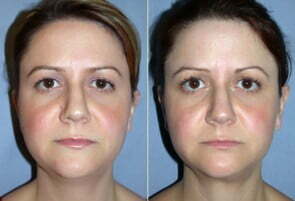 You may desire a neck lift if you have localized deposits of fat in the anterior part of the neck under the chin. A neck lift may also be indicated if you have sagging, with skin folds in the anterior part of the neck. The neck lift procedure is intended to produce a more youthful appearing neck with a better contour. Neck lift is done on an outpatient basis under sedation and local or general anesthesia. Dr. Movassaghi performs surgery at McKenzie Surgery Center or Sacred Heart Medical Center in Eugene, Oregon. The procedure may require an incision under the chin, behind the ears, or both. Fat is suctioned or excised, muscles may be tightened, and skin may be removed, all depending on individual findings. The patient goes home with chin and neck wrapped in dressings or in an elastic neck sling. Initial discomfort is easily controlled with oral medication. Swelling and bruising disappear over approximately 2 weeks. The final result of a neck lift is evident in 1 to 3 months. While a neck lift alone can produce dramatic improvements in the neck and chin contours, patients frequently choose to combine procedures to achieve more total facial rejuvenation. Additional procedures that may enhance the result of a neck lift are Face Lift, Liposuction and Chin Augmentation. For patients not quite ready for neck lift surgery, nonsurgical skin tightening with Exilis or CoolMini chin fat reduction treatments may be a good option. Exilis treatment tightens sagging skin and helps reduce fat in a treatment area. The neck lift procedure is considered cosmetic and therefore is not covered by insurance. The patient is responsible for payment. The specific risks and the suitability of neck lift for a given individual can be determined only at the time of consultation. All surgical procedures have some degree of risk. Minor complications that do not affect the outcome occur occasionally. Major complications are rare.